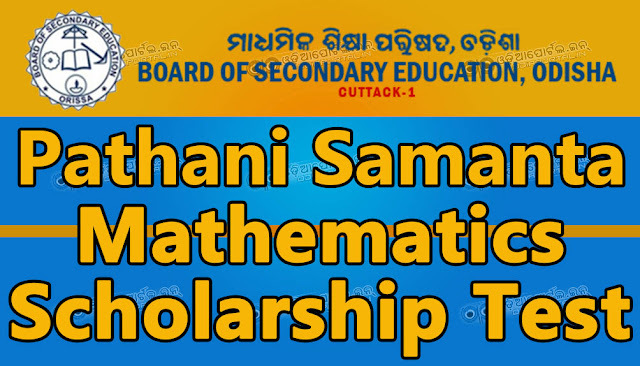 Board of Secondary Education (BSE), Odisha inviting online application for "PSMST" - Pathani Samanta Mathematics Scholarship Test (Pathani Samanta Ganita Medhabruti) 2016 from Students reading in class 6th and 9th of Recognized Odia Medium Primary Schools, Upper Primary, UGME Schools and High Schools of Odisha. The Pathani Samanta Mathematics Scholarship Test will be conducted for the following two separate stages. Stage – I (Students reading in Class-VI are eligible, who have secured more than 30% marks in Mathematics in last Class-V Annual Examination). Stage – II (Students reading in Class-IX are eligible, who have secured more than 30% marks in Mathematics in last Class-VIII Annual Examination). 2. Test will be conducted through Objective Type Questions only. 3. There will be 60 objective multiple choice questions carrying total of 150 marks. 4. Test will be administered in OMR answer sheet. Each questions will have four options and candidates have to darken the correct option in blue/ black ball point pen. Change of answer in any other mode shall not be accepted. 5. Application for the test shall be received through ONLINE REGISTRATION only from 22/08/2016 to 08/09/2016 midnight (24×7). [a] Block Education Officers for students of Primary, Upper Primary & UGME Schools under their jurisdiction. [b] Head of the Institution of Secondary Schools for their own students. 7. Authority to Log in can fill up as many applications at a time, save and finally submit the applications. 8. Only the candidates belonging to Odia medium schools are allowed for the scholarship test. 9. Correct Mobile No. & E-Mail ID shall be filled in by the Log in Authorities failing which communication shall be failed that will hamper the appearance of candidates for the Test. 10. Scanned photograph in JPG/ JPEG format with size up to 500 KB should only be uploaded. 11. The log in Authorities will have to inform all schools under their jurisdiction regarding merit of the Test, so that as many students can register for appearing the Test. 12. The authority to log in shall be held responsible for any wrong information of the candidate submitted through online registration. 2. If already registered enter Mobile / User Name & Password and then LOGIN. 3. For new registration click on SIGNUP button, a signup form will be shown (gray button). Fill all the fields in signup form, and click on signup button (blue button). 4. If all signup information are correct then a “Signup successful.” message will be shown and then click on to LOGIN. 5. Mobile No will be treated as Username for login. 6. Mobile no and password must match with the values that user, entered at the time of Signup. 1. The authority to log in (register online) shall be the Block Education Officers for students of Primary, Upper Primary & UGME Schools under their jurisdiction and Head of the Institutions of Secondary Schools for their own students. 2. After login, a profile information page will be shown. The authority to log in will fill all the information and upload his/her signature image & click on save button. 3. It is compulsory to fill complete profile information because student registration cannot start without providing user’s profile information. 1. After the profile information is saved, go to left side menu, where there is a link for Registration, click on it. 2. Registration Management page will be shown which has Registration List and +Add Registration. 3. Click on +Add Registration, so that Registration Form page will be shown. 4. Fill all informations, upload photograph and signature of the candidate and click on save button. 5. If all informations are correct, you will see a registration’s view page. 6. From registration’s view page you can EDIT the information already saved or/ and click on final submit button, which will be your final submission of registration form. 7. Please verify your record before final submission because after final submission user cannot modify student’s information. 8. The Authority to log in can register as many students for the examination following the above processes, before logging out. He can again re-enter the link and register more candidates also. 9. The Authority to log in can take the print copy of the registered students if he/ she so likes for reference before logging out.